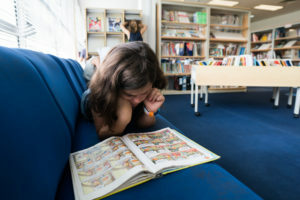 The LFKL library is a place for reading, work and research; it is open to students from the kindergarten to the Terminale class. In addition to the hours set out in the class timetables, students may go to the library freely during the breaks to study. Each year, our two literary prizes, Azimut et Segalen, are launched in December. The common theme of the two prizes this year is “traveling“, in tribute to Victor Segalen, the writer-traveler. The Segalen prize for Lycées in Asia, is intended for our students in Seconde. A selection of 5 contemporary Francophone novels is submitted for appraisal by students in the 13 Lycées of the zone. Last year we welcomed one of authors of the novels selected: Erik L’Homme for Des pas dans la neige. Created in 2006 on the initiative of the librarians in the Asia zone, this project offers students of CM2, 6ème and 5ème a selection of 5 recent novels for young students to read. In May 2019 our student will vote for the book they preferred. In addition to the reading activity, students will participate in a drawing contest; they will have to imagine and create another cover for the 5 books. As part of the project, the school will be welcoming Cédric Janvier, one of the authors of our 2019 book selection. • 200 non-fiction books, 300 picture books and 200 novels in the primary school library. • From the kindergarten to CP, children can borrow a book for a week. • In CE, they could borrow one or two books for a week. • From CM onwards, they can borrow up to three books and magazines for two weeks. Special conditions are available for keen readers! Students can use the computers to do research on the internet, in relation to their school-work. 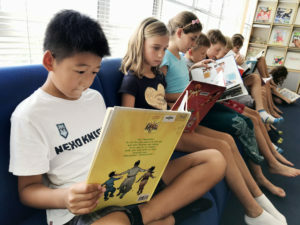 Monday, Tuesday, Thursday and Friday 8.00 a.m.-4.30 p.m.
Wednesday 8.00 a.m. to 12.00 p.m.
Students may use the secondary and primary school libraries during the lunch hour.